In the game Pups you take the role of an aspiring dog trainer with dreams of winning big at the dog show. Each round you will gather a new pack of 7 lovable pups. You must groom them for success by bidding on how well you think they can perform at the show. After everyone has placed their bids the action begins as the pups start facing off! If your pups can win the number of showdowns you bid before the round ends you will earn the reward treats. But watch out… if you miss your bid you must gain the penalty poos. The player who can collect the most treats is the winner! The Legendary Pups and the Underdog card can be added to any game of Pups for a new play experience! The 4 Legendary Pups are Cerberus, Argos, Laika, and Saurr, and they respectively take the highest seat of power (10) for each suit. The Underdog acts as a special catch-up card awarded in each hand dealt, to the player with the fewest points. 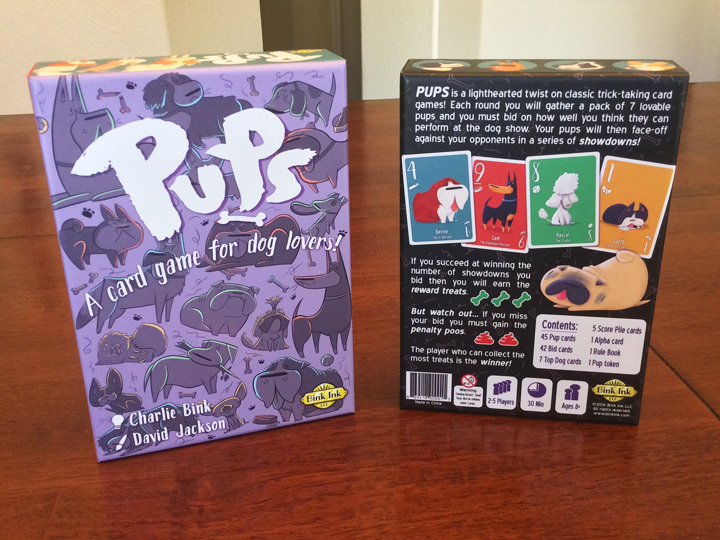 Each Pups Promo Pack also includes a rules card.